The ICCA-GSI Country Profile for Senegal features its country strategy relating to Indigenous and Community-Conserved Territories and Areas (ICCAs). Its ICCA country strategy is , is aimed at accelerating action on the ground reconcile biodiversity conservation, sustainable livelihoods, environmental stewardship, governance and management effectiveness. It was developed from a bottoms-up approach while simultaneously aligned to the National Biodiversity Strategies and Action Plans (NBSAPs), specifically to promoting the conservation and management of natural resources by local communities, as well as joint management by local communities and Departments. 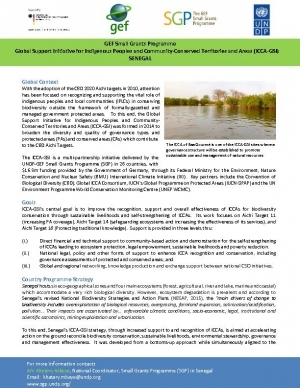 Moreover, Senegal’s ICCA-GSI initiatives supports the Plan for Emerging Senegal (PES) which considers the global biodiversity agenda and socioeconomic development plan to 2035, as well as GEF Focal Areas strategies and the 2030 Sustainable Development Goals (SDGs). 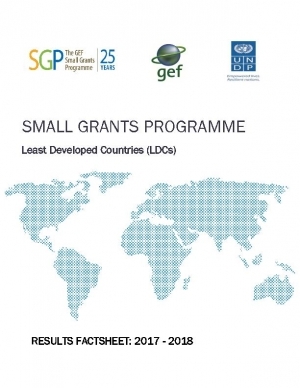 The GEF Small Grants Programme in Least Development Countries (LDCs) : Results Fact sheet 2017 -2018, provides facts for SGP work in these countries based on SGP global Annual Monitoring Report 2017 - 2018 . The GEF Small Grants Programme in Small Island Developing States (SIDS) : Results Fact sheet 2017 -2018, provides facts for SGP work in these countries based on SGP global Annual Monitoring Report 2017 - 2018 . The GEF Small Grants Programme in Pacific: Results Fact sheet 2017 -2018, provides facts for SGP work in the region based on SGP global Annual Monitoring Report 2017 - 2018 . The GEF Small Grants Programme in Arab States: Results Fact sheet 2017 -2018, provides facts for SGP work in the region based on SGP global Annual Monitoring Report 2017 - 2018 . The GEF Small Grants Programme in LAC: Results Fact sheet 2017 -2018, provides facts for SGP work in the region based on SGP global Annual Monitoring Report 2017 - 2018 . The GEF Small Grants Programme in Europe & CIS: Results Fact sheet 2017 -2018, provides facts for SGP work in the region based on SGP global Annual Monitoring Report 2017 - 2018 . The GEF Small Grants Programme in Asia: Results Fact sheet 2017 -2018, provides facts for SGP work in the region based on SGP global Annual Monitoring Report 2017 - 2018 . The GEF Small Grants Programme in Africa: Results Fact sheet 2017 -2018, provides facts for SGP work in the region based on SGP global Annual Monitoring Report 2017 - 2018 . 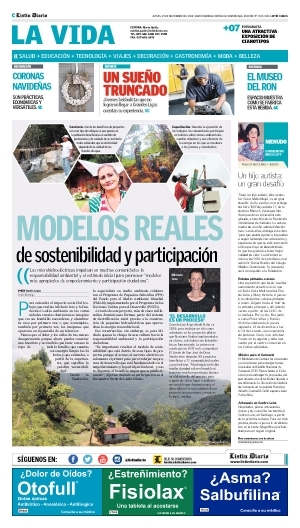 Listin Diario, the newspaper published in Dominican Republic , has featured SGP in her articles of November - December 2018.